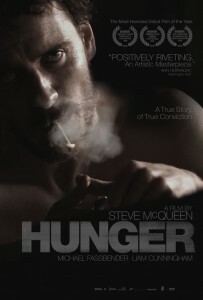 The double meaning in this astonishing film’s title refers to both the hunger for food as well as for freedom. The prisoners in this factually-based and brutally realistic film are starved for both. In 1981, during the troubles in Northern Ireland, the UK government was imprisoning IRA members but refusing to give them political prisoner status. As a result a group detained at the HM Prison Maze (aka Long Kesh), led by Bobby Sands, went on “blanket protest” which basically meant refusing prison uniforms. This led to them being exposed to almost unimaginably horrendous conditions and as well as to a series of violent repercussions. The film, the first directed by British multi-media artist Steve McQueen, opens with a middle aged man beginning his day. Much of his initial behavior seems mundane; getting dressed and being served toast &amp; tea by his wife. But then we see him soaking his bloodied and swollen knuckles in the bathroom sink; and, just before he drives off to work, he kneels down to look under his car for a bomb. This man turns out to be prison guard, Raymond Lohan (Stuart Graham). The film’s narrative is confusing at first; we assume that the story will be about this wounded individual. We also assume that he is carrying around fear, guilt and grief since he works in such a brutal environment. Surely he must feel ambivalent about his job. 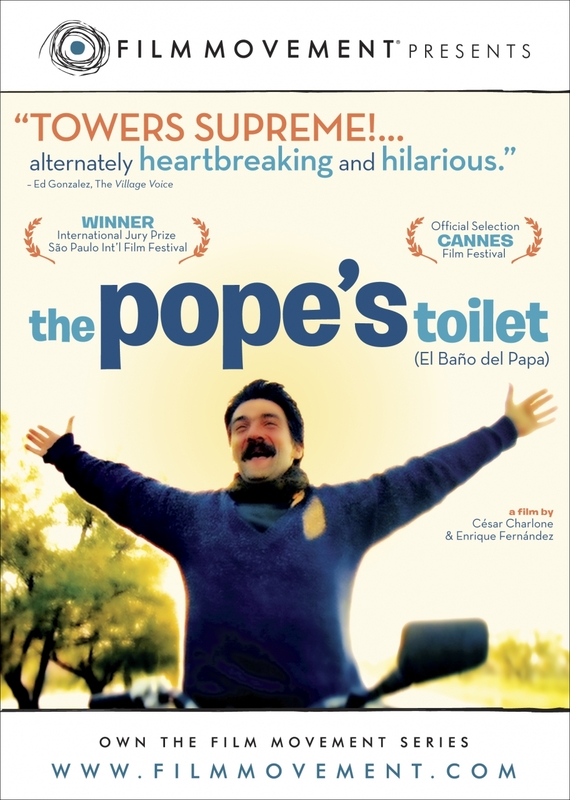 In sturdier economic times, Cesar Charlone and Enrique Fernandez’s film “The Pope’s Toilet” might have resonated less. It’s hard not to buy into and be won over by the unflappable Beto (César Troncoso), a smuggler of petty contraband who struggles to provide for his wife Carmen (Virginia Méndez) and their teenage daughter Sylvia (Virginia Ruiz). Along with a small band of his neighbors, Beto makes daily trips across the nearby border on his ramshackle bicycle from his impoverished Uruguayan village of Melo to Brazil. (His trips back are invariably disrupted by corrupt customs agents and the border patrol.) Beto has many reasons to feel oppressed and downtrodden in a scenario which much resembles that of his cinematic ancestor Antonio Ricci (“Bicycle Thieves”), who too had to rely on two wheels for economic survival. Good news comes in the visit of Pope John Paul II, whose itinerary has him stopping in Melo where some 50,000 visitors are expected. An ever enterprising Beto decides that a pay toilet built only yards from the crowds will be the solution to all his family’s financial problems. Crunching the numbers with Carmen, Melo even believes that the proceeds will pay for their daughter’s tuition. Sylvia, much like her Dad, has ambitions of her own, which do not include sewing school. Bright and attractive, she is a most believable bi-product of her parents in a moderately paced movie which doesn’t emphasize character development. 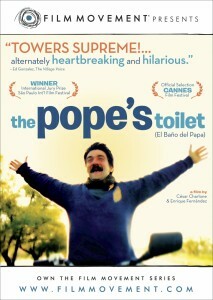 The tone is “The Pope’s Toilet’s” biggest challenge. Whether the movie is trying to be an inspirational drama in the legacy of Angela’s Ashes, or an offbeat comedy (remember that on the surface this movie is about making a toilet), remains a question. Lovingly photographed by César Charlone, it is in the end worthwhile and quietly moving. In an age when one must think of new ways and means just to make ends meet, Beto is indeed a man ahead of his time. 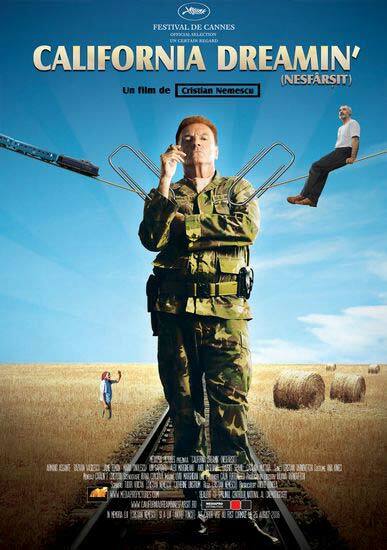 On the heels of “The Death of Mr. Lazarescu”, “4 Months, 3 Weeks and 2 Days”, and what is commonly being referred to as the Romanian New Wave comes “California Dreamin’”, a relatively lighthearted tale. The darker and sadder story here is that Cristian Nemescu, the film’s director, died in a car accident shortly after finishing this, his only feature film. At the very least, it can be said that the director had a sure hand and a promising career ahead of him. In A. O. Scott’s feature article in last January’s New York Times Magazine, the reviewer formally introduced the rising Romanian film movement to mainstream America. But to compare it to, say, the French New Wave might be a bit premature, but clearly, as Scott illustrated, something has taken hold in that part of the world. While Lazarescu and “4 Months”, directed by Cristi Puiu and Cristian Mungiu respectively, were reminiscent of cinema vérité, with long continuous passages shot in what seems like real time (think Andrei Tarkovsky or, more recently, Bela Tarr), “California Dreamin’”, by contrast, seems positively upbeat as its title suggests. Nemescu’s technique is traditional linear storytelling. 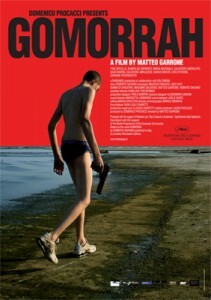 After watching “Gomorrah”, you’re likely never to have much of a vicarious thrill watching a movie mob hit again. Actually, considering the reach of the Neapolitan crime network—or Camorra as it is locally referred—the glamorous lure of crime films should be the least of one’s concerns. Bleak, brutal, and raw, Gomorrah is told in a matter-of-fact yet intense manner that in no way fetishizes gangland crime, as is the case with many movies and the Sicilian Mafia. Perhaps it’s due to the immigrant saga and the pursuit of the American Dream, but the Sicilian Mafia has gotten some very good mileage out of Hollywood. These films, as violent as they may be, usually include a code of honor, which makes the movies more palatable. With the Camorra—Gomorrah is a convenient and appropriate variation—rules are always changing, and loyalty to someone one day can get you killed the next.